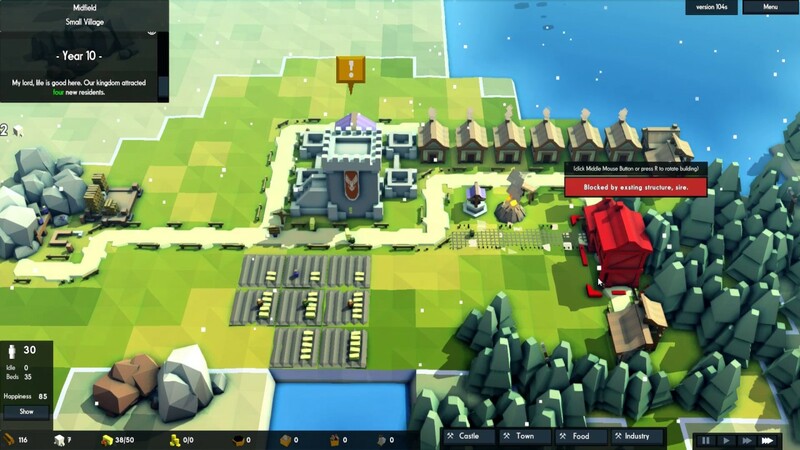 If you’re looking for a city builder involving kingdoms and castles, you’re in luck as a PC steam game called….Kingdoms and Castles has just arrived. With a somewhat simplistic yet friendly look, how does this title fair out compared to other similar titles within this genre? 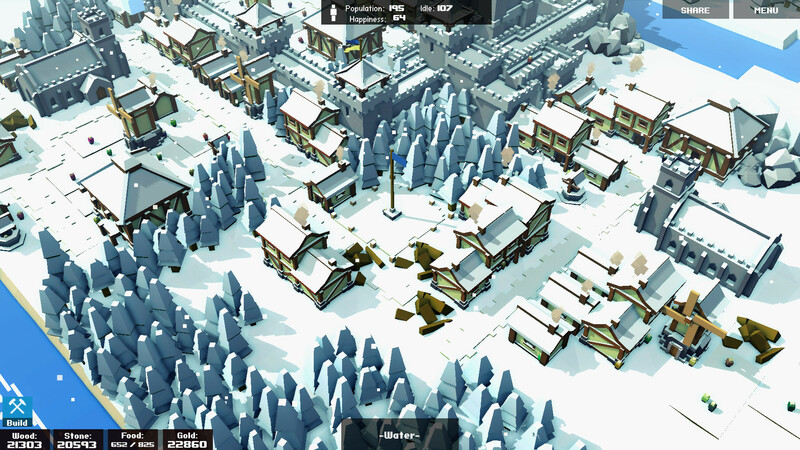 Kingdoms and Castles is pretty user-friendly whether you are familiar with type of game or not. There is also clarification on what type of resources are required for certain types of building structures. It’s very straightforward and easy to pick up and play immediately. Here in the world of Kingdoms and Castles, you take control of your little character and attempt to grow your village with a castle ruling over it. Progressing further on will require you to feed your villagers and protect your village from vikings by building up walls. As well, other factors come into play when you have rough seasons having adverse effects on your crops and livestock along with dragons that can bring danger to your villagers. From the start, it will be tough to get through and be creative with all the trial-and-error that you’ll be going through. There is limited supply of food and building materials. As such, you may begin with making some houses, farms and a small network of roads. You’ll also need to ensure that you have enough workers to doing their job. Finding that optimal situation of building may take time. But once you figure it out, your village will grow along with an increase number of citizens to add to the population. Since not all spots on the map can be used for farms, you’ll have to incorporate other buildings to effectively utilize your resources. For instance, you can employ windmills to help out the farms and granaries. One issue I do notice is how villagers can take up a lot of time travelling between granaries and farms. This is relevant when you need to store your entire harvest before the next season comes along. But that’s not just all you need to do. Also required for consideration is the economy, the villagers’ roles and the whole planning. You also want to ensure your villagers remain happy. This means that they need to be well fed, not overworked, and have convenient access to churches, libraries, or even taverns. So it’s a different added dimension to this city builder title that gives some variety to the overall gameplay. The result is a gaming mechanic that is simplistic which can be a turn off to those players expecting more degree of complexity for this genre. Nonetheless, what may be limited in complexity is made up in content and diversity here. Kingdoms and Castles is presented visually as a kid-friendly and cute appearance. It’s quite colorful and pleasing to look at. Additionally, the audio implementation works nicely to blend in with the environment. While it may not be a visual and audio feast, it gets the job done. 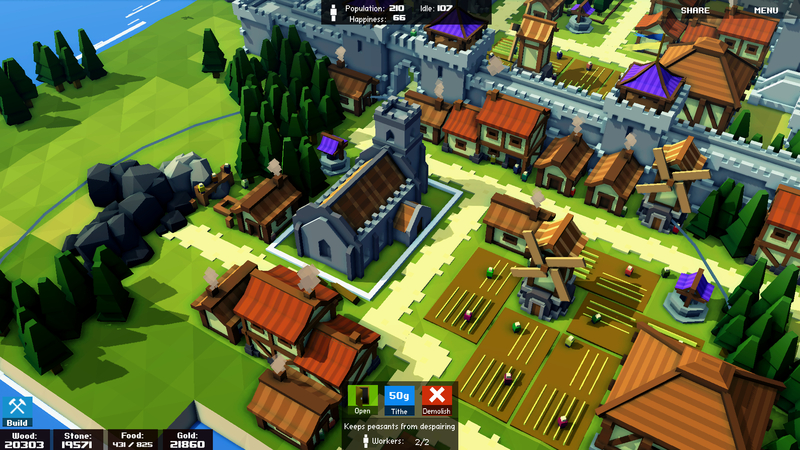 If you’re looking to build medieval villages without all the complexity, then Kingdoms and Castles may be right for you. Otherwise, you may feel that it’s missing quite a bit if you have a lot of expectations. Keep in mind though that for a very reasonable price, you get a nice and simple city builder that will at least get you smiling.